ABC Wednesday: T is for two intros. This was the site for ABC Wednesday for Rounds 9-20. It was a fun project. It is now located at http://abcwednesday.com Go there and participate. What Time Is It Around the World? Remember: if you participate with us, please link to and mention us in your post. T is for two intros. T is for turkeys and tarantulas. It's about ticklish turtles and tubby toads as well as talkative toddlers. T is for a tall tyrannosaurus tumbling on a trampoline while sipping tea. T is for giving thanks. T is the letter for Today. From trials and tribulations to triumphs and treasures, our lives are filled with both good and bad things that start with T.
So what T's were a part your life today? Did you travel to another town? Take a picture of a turtle with a telephone? Make a trip to the Emergency room at Two AM? Tie a line on your fishing pole? See a wild turkey and try to talk to it, using a turkey call ? Take a Toddler to Task? I like the tall tyrannosaurus sipping tea! He must be very civilized and brought up in England. Your choices are many and varied; some I like, others I would avoid. Taking a nap seems to be the most desirable! You had a trying day, Troy! Great post for T day. So many different T words and terrifically fun arrangement. Trip to the emergency room?? Troy, I hope y'all are OK now. we are off to a great start with that introduction to the T's. I really enjoy the introductions to each week, to see what you come up with for us. I am so glad I can continue to do this meme as it keeps my mind spinning with ideas!! thanks, Troy! great intro - fun as always! 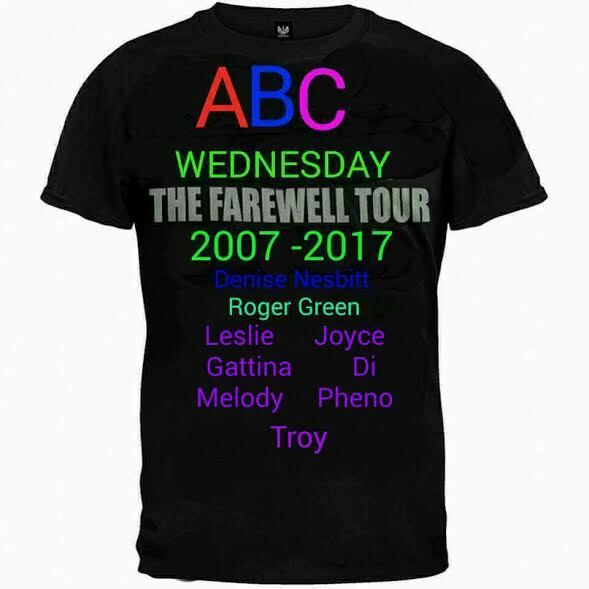 Happy Wednesday to all the ABC Wednesday bloggers. Haha - I was getting a kick out of the phone and turtle and imagining how that one was arranged! Great post! Hi! I found your blog hop through Meryl at Departing the Text. I pinned to my Wednesday blog hop page and I'll be back next week to link up. Thanks! you if it's allright. Could it be only me or do a few of the responses look like they are written by brain dead visitors? :-P And, if you are posting at additional places, I'd like to follow you.